The map at left is an example of what is posted each day. 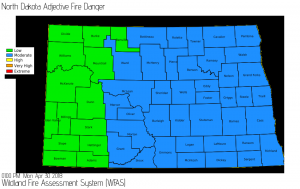 Stutsman County Emergency Manager Jerry Bergquist says according to the county Ordinance, open outdoor fires are prohibited when the fire danger rating is in the High or Extreme category. Zoning Ordinances can be found at stutsman.nd.us under Departments.